If you are located in South Africa, you may feel that the latest in high-tech gadgets are out of your reach. Fortunately, this is not the case. There are now buying options for those in South Africa, Singapore, Malaysia and other countries that rely on international shipping. If you are looking for a new gadget to watch movies or read books on, where do you go first? Do you go for that new laptop? Or perhaps an E-reader or tablet? What about one device that fits into all of those categories? One that can tackle work, play and creativity seamlessly? This is what the Microsoft Surface 3 & Microsoft Surface Pro 3 aim to do. "The tablet that can replace your laptop" is its tagline, and while the original Microsoft Surface didn't do so well right out of the gate, its successors have been building momentum. Now, with the excitement and impending arrival of the Microsoft Surface Pro 4, it looks like they have indeed accomplished what they have set out to do. Let's take a look at what this lightweight laptop replacement can really do. The Microsoft Surface 3 & Microsoft Surface 3 Pro: A Less Expensive Laptop Replacement? It runs the full version of Windows. This was the last model's biggest flaws, and it makes the Surface 3 a much better bargain. The kickstand now has three different positions: Lap, desk and couch. This is a big improvement over the last version, which only had two settings, although it is not as good as the pro version. For the price, the new Microsoft Surface Pro 3 is a light, portable and effective tool that is ideal for business, creativity and entertainment. It is important to note that the keyboard is sold separately. The screen. 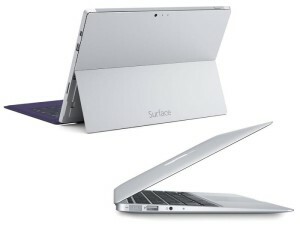 The Microsoft Surface 3 has a 10.8 inch display and the Microsoft Surface Pro 3 has a 12 inch. The resolution of the Surface Pro 3 is higher as well. Now, some might consider the Microsoft Surface 3's smaller screen size to be an advantage. After all, this means that the overall size is much more compact. For others, a larger screen with a higher resolution means a better viewing experience. This all comes down to your personal preference. The Microsoft Surface Pro 3 is more adjustable. While the new Microsoft Surface 3 features an improved ability to adjust, it still doesn't have the ability to adjust to any position, as the Pro 3 does. This can make a huge difference in user experience. 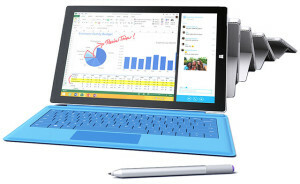 The Microsoft Surface Pro 3 Pro is faster with a 1.9 GHz processor versus the Microsoft Surface 3 and its 1.6 GHz. The Microsoft Surface Pro 3 also has 8GB of RAM, instead of the 4GB with the Surface 3, and 250GB of storage, versus 128GB. But, for most people, the Microsoft Surface 3 is more than fast enough for their daily activities for business or pleasure. 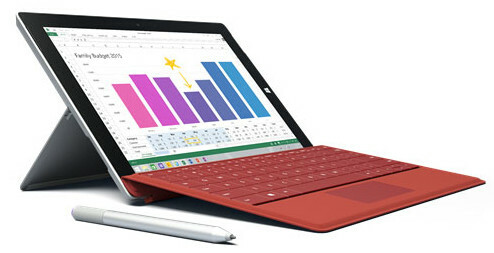 Other features that make both the Microsoft Surface 3 and the Microsoft Surface Pro 3 a great investment are the long battery life (up to 10 hours) and the included pen, which can be used with a variety of applications. This combination of notebook and tablet makes whatever you are doing online quick, easy and pleasant. They are both very mobile and easy to pack along on business trips and vacations. Of course, improvements continue to be made, and it will be interesting to see where the Microsoft Surface Pro 4 takes us in the future. For those interested in the Microsoft Surface 3 & Microsoft Surface Pro 3 who are living overseas, it can be frustrating to get your hands on the latest tech. If you are living in countries such as South Africa, Singapore or Malaysia, it isn't always easy to get international shipping for tech products like a tablet or a notebook. Fortunately, Big Apple Buddy can make sure you get the products you need without the long wait. If you are interested in purchasing the Microsoft Surface 3 or Microsoft Surface Pro 3 tablets for worldwide shipping, contact us for a free shipping quote!